The Twelfth Judicial District Commission on Judicial Performance recommends by a vote of 7 to 2, with 1 commissioner abstaining from the vote, that Judge Kimberly Lynn Wood BE RETAINED. Judge Wood received her undergraduate degree from Baylor University and graduated from Washington & Lee School of Law. Judge Wood was appointed to the Costilla County bench in January of 2003. 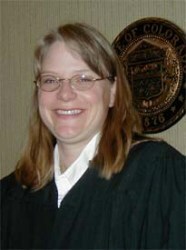 Prior to her appointment, Judge Wood served as the Twelfth Judicial District’s Juvenile Magistrate for two years. She also served as a Deputy District Attorney for one year and was in private practice for eight years, in the areas of family law, criminal defense (juvenile and adult), dependency and neglect matters, and general civil litigation. The Costilla County judgeship is a part-time position. Judge Wood also serves as the Twelfth Judicial District’s Domestic Relations Magistrate and presides over the Family Treatment Court. The Judicial Performance Commission does not evaluate Judge Wood’s performance as the Domestic Relations Magistrate or her work with the Family Treatment Court. Judge Wood serves her community in numerous other ways, including being a member of the Costilla County Volunteer Fire Department and participating on the Colorado Chapter of the Association of Family and Conciliation Courts. Over the last year, Judge Wood has worked diligently with programs dealing with breast cancer, including the Process Improvement Team at the SLVRMC and Casting for Recovery, a program that organizes fly fishing retreats for breast cancer survivors. In arriving at its decision, the Commission reviewed surveys from attorneys and non-attorneys, including litigants, jurors, and others who have appeared before Judge Wood during the retention period. The Commission also reviewed Judge Wood’s self-evaluation and transcripts of samples of her rulings. Finally, the Commissioners observed Judge Wood’s courtroom and conducted a personal interview. Of attorneys responding to the survey, 52% recommended that Judge Wood be retained, 24% recommended that she not be retained, and 24% made no recommendation. Of the non-attorney respondents to the survey, 73% recommended that Judge Wood be retained, 20% recommended that she not be retained, and 7% made no recommendation. As a County Court Judge, Judge Wood presides over non-felony criminal cases, civil cases under $15,000, traffic cases, and small claims cases. Survey Results revealed that Judge Wood received an average overall rating below that of other county judges statewide who are also up for retention among both attorneys and non-attorneys; however, the Commission recognized that Judge Wood’s scores in all areas have increased from the previous retention cycle. The Commission further noticed improvement in Judge Wood’s temperament and demeanor while on the bench. The commission did note some concern that no writing samples were submitted for review, as only transcripts from rulings from the bench were submitted. The Commission did receive negative feedback from a few attorneys and litigants appearing before Judge Wood. Attorney respondents addressed Judge Wood’s legal reasoning skills, while non-attorney respondents feel that Judge Wood’s rulings are not solely based on the application of the law to the facts before her.